Band Stand at Lal Bagh, Bangalore. bl.uk > Online Gallery Home	> Online exhibitions	> Asia, Pacific and Africa Collections	> Band Stand at Lal Bagh, Bangalore. 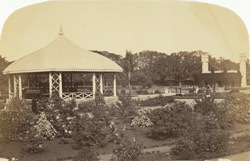 A photograph of the Band Stand at the Lal Bagh Gardens in Bangalore from the 'Vibart Collection of Views in South India' taken by by an unknown photographer about 1855. These pleasure gardens belonged to Haidar Ali and later his son Tipu Sultan. It was made into a horticultural garden in 1856 under the management of a professional Superintendent. A Band Stand was soon added from where music was played in the evenings. Later a handsome and spacious conservatory was built, the foundation stone of which was laid on the eve of the visit of Prince Albert Victor Wales to the gardens.